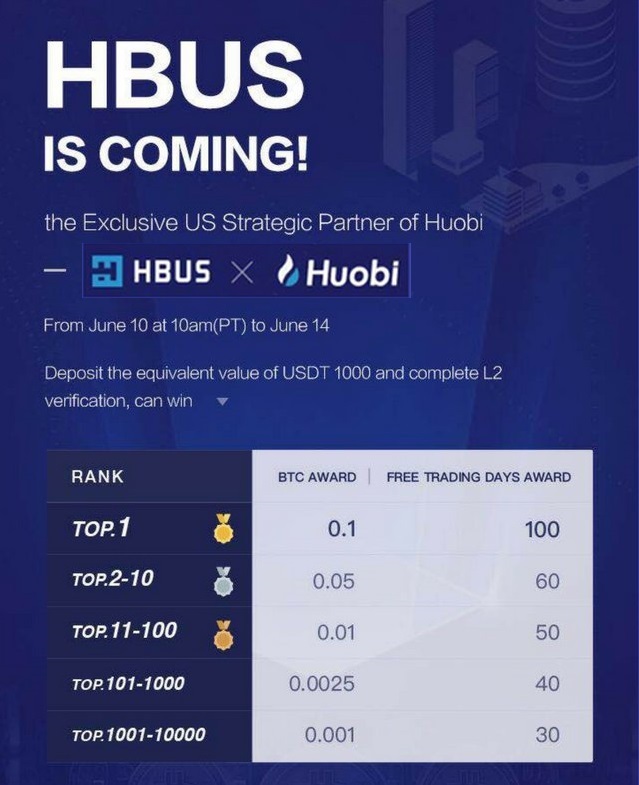 The exclusive US Strategic Partner of Huobi, HBUS, is set to launch on June 10th. Headquartered in Singapore, Huobi.pro is a leading global digital asset exchange currently enabling the trading of over 100 digital assets. The Huobi exchange currently commands the third highest trading volume (amongst exchanges) in the digital assets space. With a trading volume of near about $1.2 billion as of June 5th, Huobi stood behind just Binance (with ~$1.6 billion 24h trading volume) and OKEx (~$1,5 billion) exchanges. Top 3 digital assets traded on the Huobi platform are EOS (EOS), Bitcoin (BTC), and the Huobi Token (HT). With HBUS opening up as the exchange’s strategic partner in the US, there’s a good chance for Huobi’s market dominance as an exchange to rise. According to the company’s website, HBUS strives to be a reliable and efficient marketplace for a rich selection of high-quality virtual currencies. To celebrate their launch, HBUS has announced a BTC giveaway along with a zero fee trading promotion. HBUS will rank users based on the time of completion of the deposit and verification tasks. Users in each rank category will win corresponding prizes in the form of BTC prizes and zero trading fee periods, as set forth in the image. Eligible winners will be announced on the company’s social media accounts daily. BTC prizes will be deposited into the winners’ HBUS virtual currency wallets within 48 hours after the promotion ends. Registration on this US-based virtual currency exchange will begin at 10 am on June 10, 2018 (PT), allowing users to create accounts and make deposits. However, trading, execution of orders, and withdrawals from the exchange will only begin at 10 am on June 15th, 2018 (PT). The HBUS launch is certainly good news for Huobi and the cryptocurrency community at large. Already the third largest crypto exchange, the HBUS launch should help Huobi tap into the growing US market for cryptocurrencies better, and gain market dominance. In the current setting, (a) regulation, (b) security threats, and (c) market volatility, remain inevitable risks to most cryptocurrency exchanges’ operation and profitability. How well Huobi-HBUS handles these, is yet to be seen.